In a large mixing bowl, combine almond butter, banana, honey and Himalayan Pink Salt. Add chopped nuts to mixture. 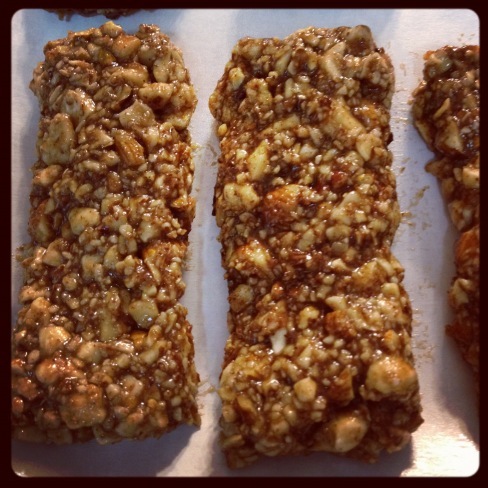 Using a 1/4 C to portion energy bars, mold into whatever shape you desire. To keep energy bars raw, dehydrate at 105 degrees for 9 hours, then chill. Or, bake at 350 degrees for 10 minutes. Let chill. Wrap individual bars, and enjoy a healthy snack after a morning workout, for a mid-day pick me up, or for breakfast on the go! To feeling alive!